Blueberries truly are a superfood. A recent study published by Cornell University scientists named blueberries as the food with the highest level of antioxidant activity. They're also packed with vitamin C, anti-inflammatory properties, and phytoflavinoids -- a term where phyto means "referring to plants," and flavonoid describes the rich, deep pigment of the plant. The more colorful the berry, the more antioxidants it has. The almonds in this recipe work best when first blanched. This means that the skins have been removed. If you have almonds with the skins still on, it's easy to remove them yourself. Add the almonds to a pot of boiling water and let them boil for about 30 seconds, then drain. The almond skins should now be loose enough to slide off by hand -- try pinching each almond at its wide end to remove the skin. Also, if you don't have parchment paper on hand, you can grease the baking pan with butter, then dust with flour and shake out the excess. Preheat oven to 350 degrees and line a 9x13 baking pan with parchment paper. Toast almonds on baking sheet in 350-degree oven for 10 to 15 minutes, shaking often, until golden brown. Put almonds in blender or food processor and grind until fine. Put flour, ground almonds, salt, and cinnamon in a bowl and set aside. In mixing bowl, put 3/4 C plus 1 Tbsp. sugar and butter, and mix with beater until light and fluffy. Add almond extract and continue beating until just blended. Slowly add flour mixture, mixing with beater on medium until crumbly texture develops. Remove 1 cup of crumbly dough from bowl and set aside. Press remaining dough into a crust just on the bottom of the baking pan. In a bowl, toss together the blueberries, orange zest, and remaining 1 Tbsp sugar, then arrange evenly over the dough in pan. 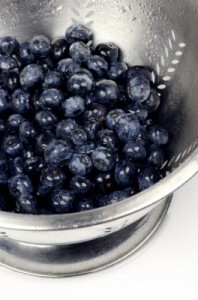 Take 1 cup of crumbly dough that was set aside and sprinkle over blueberries evenly. Bake in preheated oven at 350 degrees for 30 to 35 minutes or until golden brown. Remove and let cool in pan for 10 minutes. Cut into squares when cooled.